I didn't do a lot of paper crafting this past week, but what a fun week we had! Family, friends and travel! There are probably few things as sweet as quietly watching a 21-month-old feed ducks and fish. 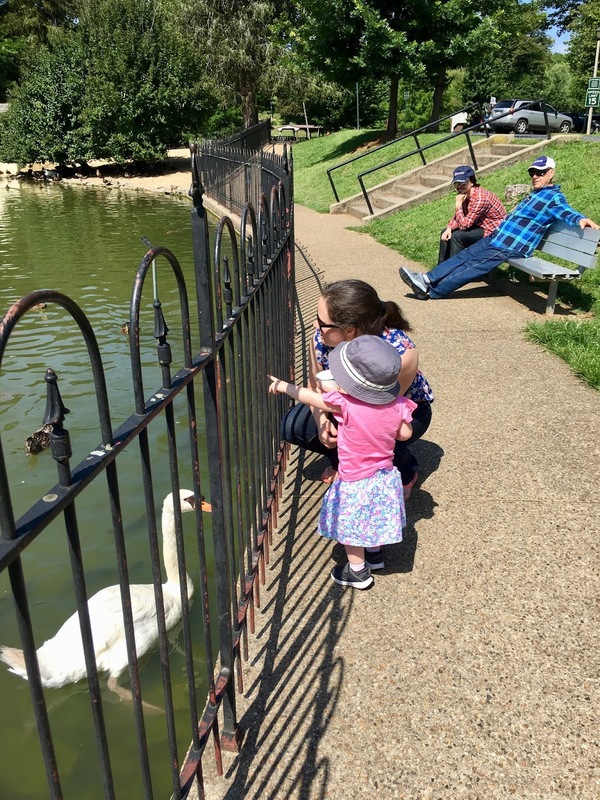 Our little granddaughter was mesmerized by the "Mommy Duck!" and "Daddy Duck!" even though the swan was right in front of her and desperately wanted her attention. After our fun at the park we went out to lunch, then we had some sorbet on Beverly Street. 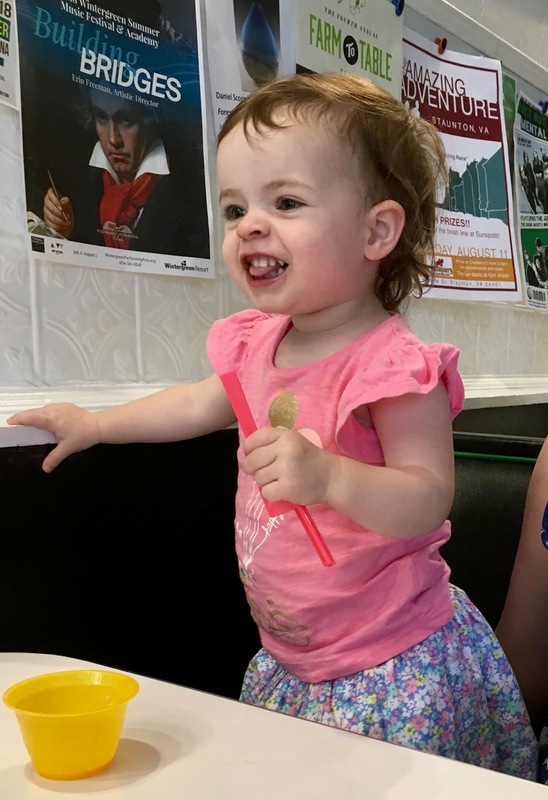 Our little Sweetie really liked this part of the day! 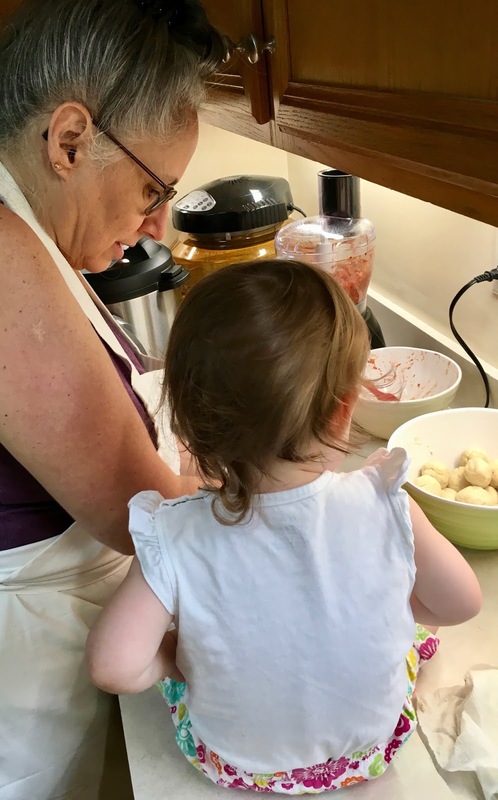 Just like her grandmother, our baby likes to "cook"... in this case "cooking" means sitting on the counter and helping Grammy make tortillas. 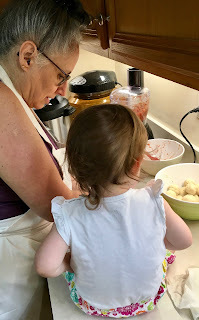 Her favorite part was putting the squishy balls of dough on the the tortilla press. 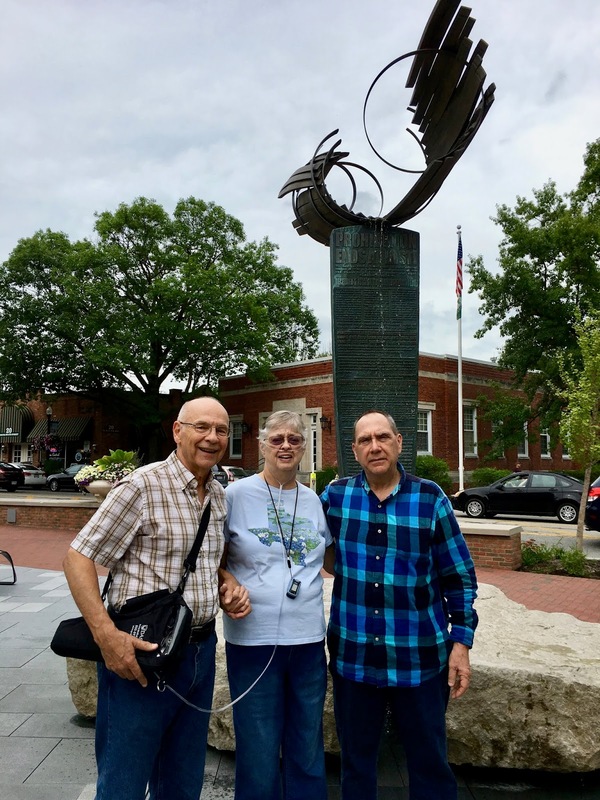 Then hubby and I went to Ohio to visit with some dear friends for a couple of days. It was fun to catch up with them and remember "old times" together. 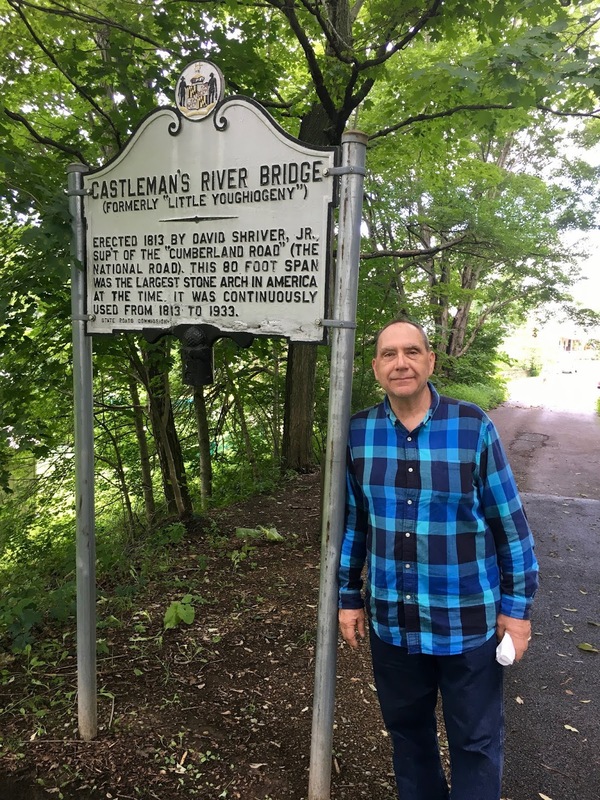 On the way back to Virginia we made a couple of sightseeing stops. Since we own an electric car, stopping for a "leisurely rest" is a necessity because it takes a bit longer to "charge" a car versus "gas" a car. But once we got back home I got back to my craft room and back to making paper crafts! 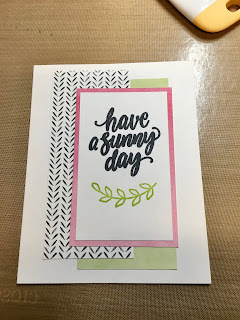 Of course I have plenty of memories to scrapbook now, but my husband requested I make a card for him to send to his sister... so that took precedence. 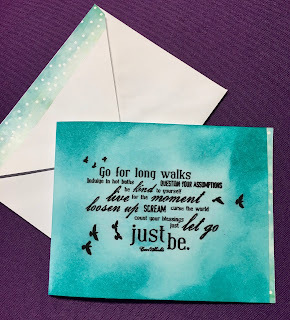 Since it was to be a card from a man, I figured he didn't want a lot of lace and pearls, so I decided to keep it simple with stamping and color blending. 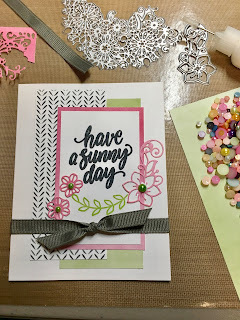 Besides, it never ceases to amaze me how a simple piece of white cardstock can be cut, stamped and colored with a few simple supplies to transform it into a lovely card. To protect the card, once finished, I covered and polished the front with Tim Holtz Distress Glaze. 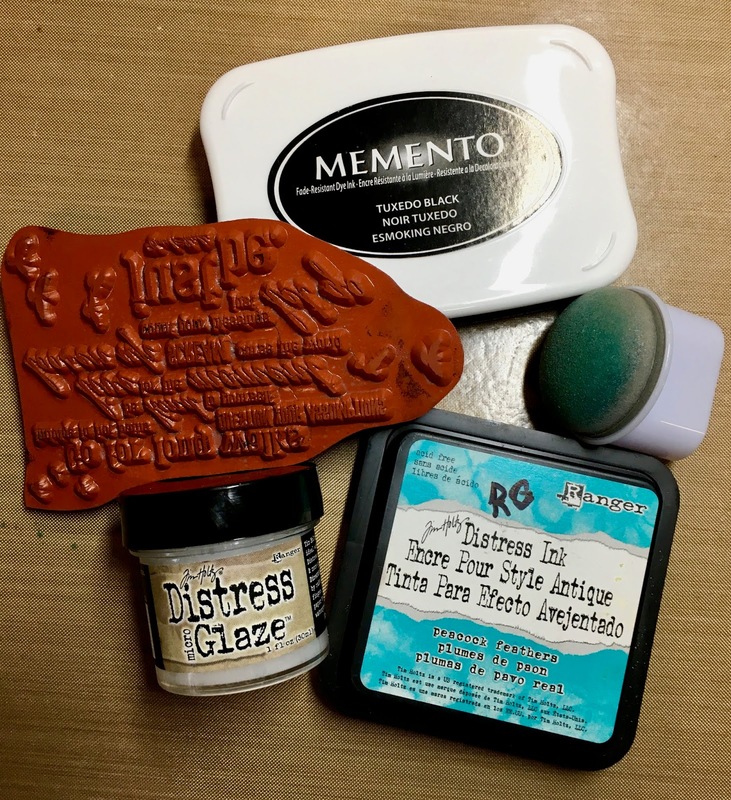 I love how this protects cards from moisture, ink rub, and leaves a soft sheen. 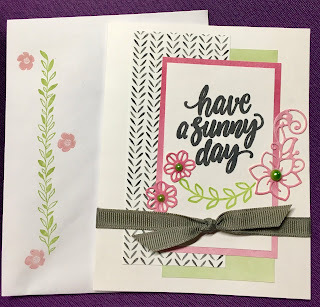 I also used a bit of Washi tape for the card and the envelope. I cut the front of the card 1/4" shorter so that the Washi tape would peek out from the inside of the card. Then, using the same tape, I matched the envelope to the card. I also wanted to make another card for another family member... so I got out my dies and Cricut Cuttlebug. 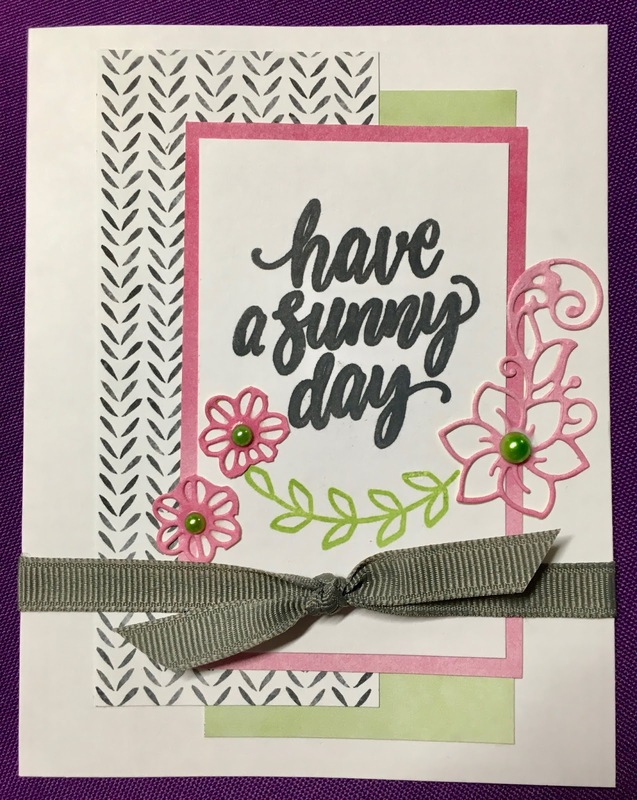 I got the inspiration for this card from the Close To My Heart (CTMH) catalog, but I adapted it to supplies I already own. 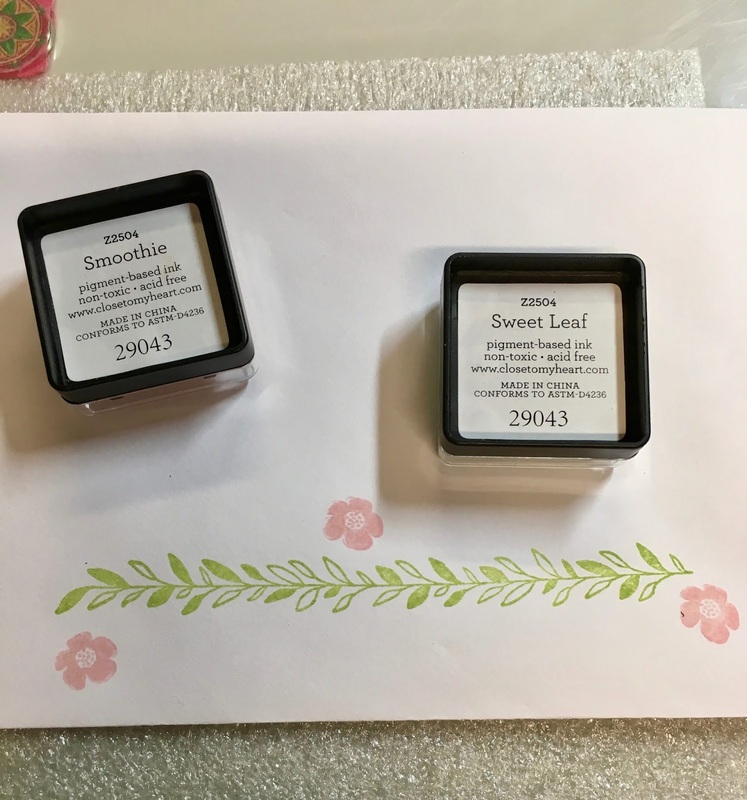 First I placed my white cardstock on my stamping platform and aligned my stamps in the position I wanted them. 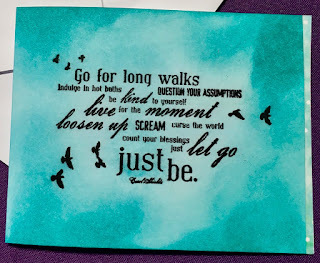 Then I stamped the sentiment with CTMH Charcoal pigment ink. Next I moved on to stamping the leaves, using CTMH Sweet Leaf pigment ink. Time to add some embellishments! 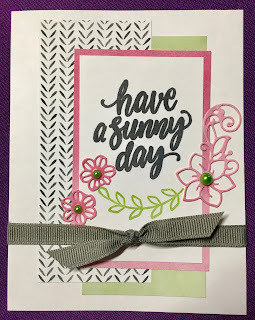 I had some gray ribbon in my stash so that is what I used. 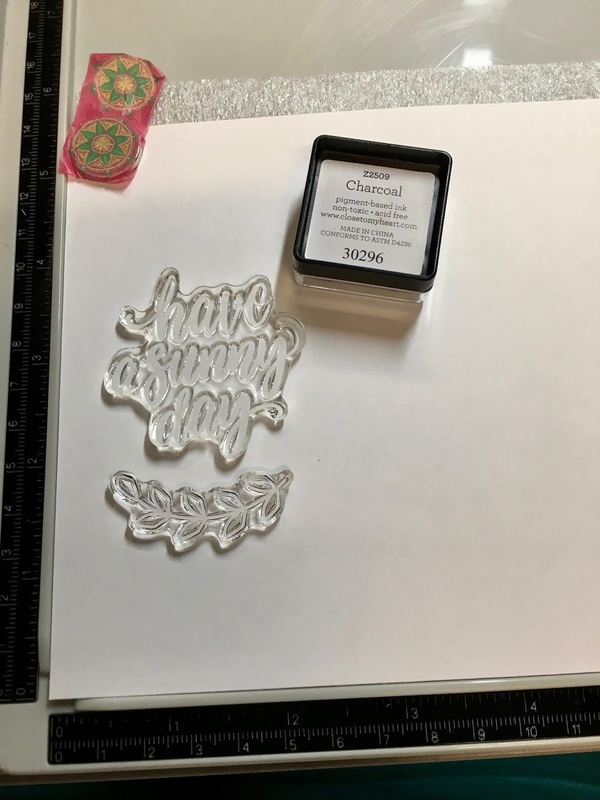 I also cut out some pink flowers using some dies and my Cricut Cuttlebug. Lastly, I glued on some pearlescent bling to bring the green into the flowers. 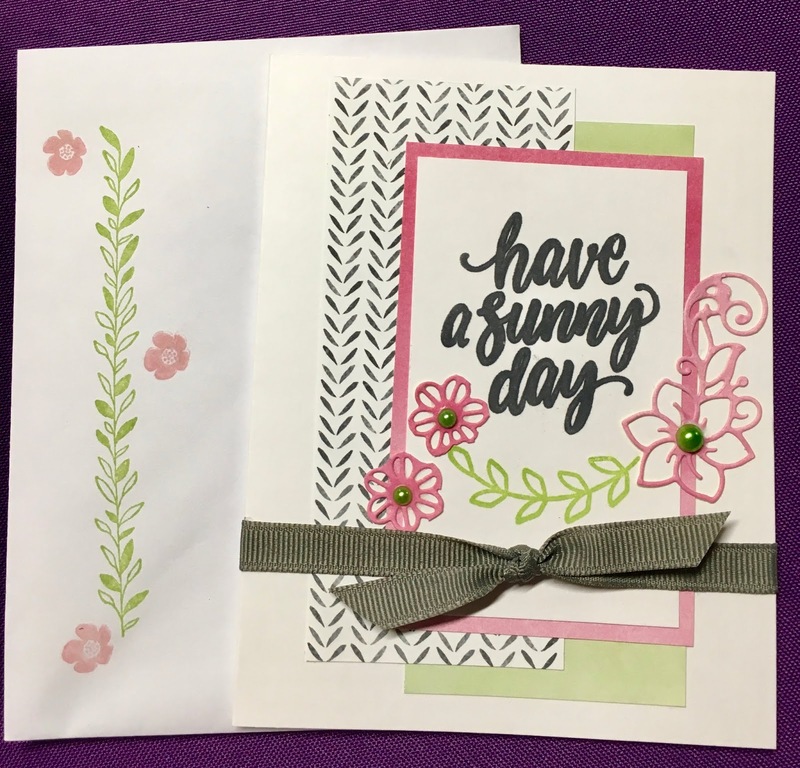 Next it was time to create an envelop to match the card. 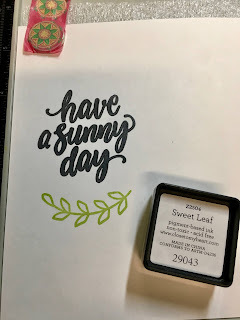 I stamped the envelope with the same colors using stamps from the same CTMH "Sunny Thoughts" stamp set that I used for the sentiment. 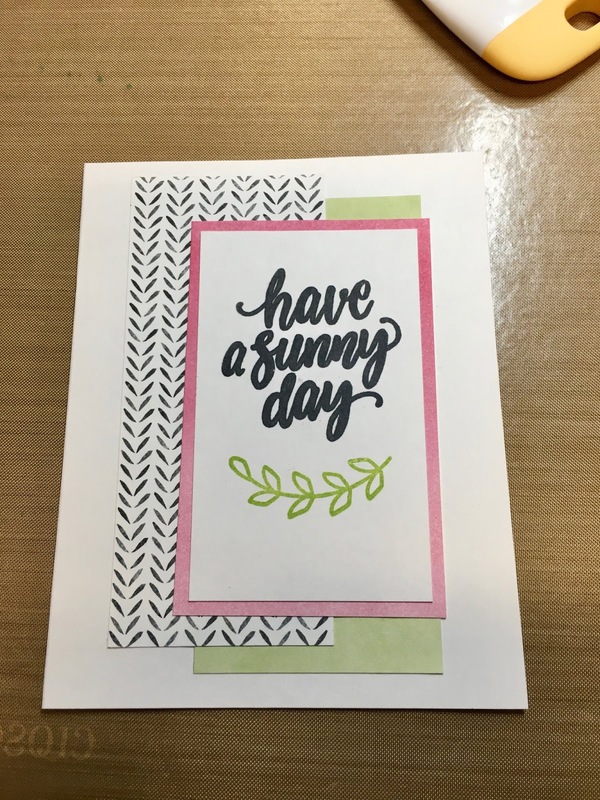 Now the card is ready to add a personal message and mail! By the way... Bluprint is providing a special offer right now... a 7 Day Free Trial! 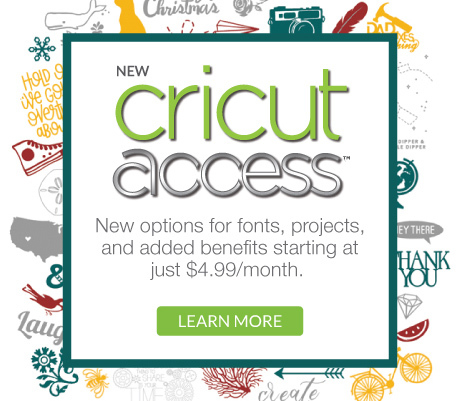 You might want to check that out... it is an easy way to learn new skills or advance skills you already have. 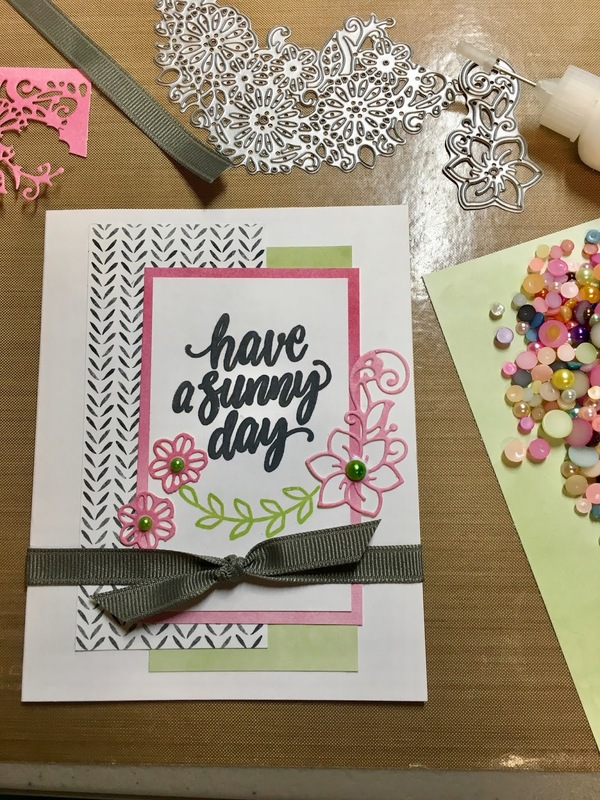 From sewing to paper crafting to photography and more... you can find your interest on Bluprint. 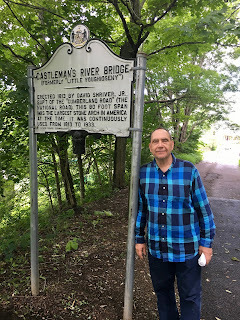 As always, thank you for stopping in to my blog. If you have any questions or comments then please leave them for me below. I love hearing from you!